After winning the Championship in 2010 and going to the finals again in 2011, the Stealth finished dead last in 2012, the only team out of the playoffs. Safe to say that nobody saw that coming. Head coach Chris Hall missed about six games at the beginning of the season but when he returned, nothing changed. Jeff Zywicki missed five games in February but when he returned, nothing changed. Tyler Richards missed three games in February and March but when he returned, nothing changed. The offense was struggling and they traded Paul Rabil for Athan Iannucci, but nothing changed. Things seemed to be turning around in March, when they beat Toronto, split a home-and-home with Colorado, then after losing to the Rush they scored 20 against the Swarm. I started to wonder if maybe the Stealth would gain some momentum at the end of the season and even if they didn’t make the playoffs, go out with a bang. But the bang turned to a whimper as they lost their last four. I said in my west division wrap-up last year that “it wouldn’t surprise me if the 2013 Stealth isn’t significantly different from the 2012 Stealth” which is a confusingly-worded way of saying that I didn’t expect any huge changes. But I didn’t expect them to do almost nothing. Cam Sedgwick and former captain Jason Bloom both retired and joined the coaching staff, and Kyle Hartzell was traded to Philadelphia. That’s it. Veteran Jeff Zywicki was also cut during training camp, but he’s been battling injury problems for a couple of years; he missed a bunch of games last year and most of 2011. This team isn’t really as bad as they looked last year, are they? No. I think they can battle Colorado for the middle of the pack in the west, but they won’t catch the Swarm or Roughnecks. Fourth in the west. 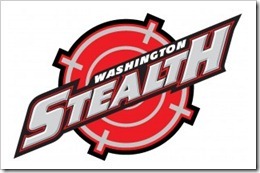 This entry was posted in Predictions, Preview, Washington Stealth. Bookmark the permalink. Until they cut/trade Ratcliff they'll continue to be the worst team in the league. Zywicki had 2 knee surgeries; but lots of guys come back after that. I wouldn't be surprised if Philly signs him; they could use him. He looked healthy at training camp this year and, if we know Zywicki, tell him he can't do something and he'll do it twice as good!